← Orality and Literacy – In What Ways Are Oral and Literate Cultures Similar? Please follow this link to view my formal commentary, Bridging Dichotomies. For my commentary I attempted to explore the possibilities of a hypertext writing space. 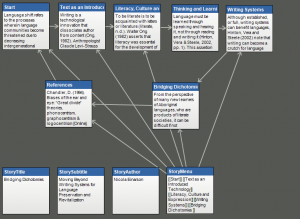 I used a tool for creating interactive stories called Twine. Twine allows for graphic organization of textual stories and is written in a format similar to wiki markup. When the story is complete, Twine creates an .html file. What I did not anticipate was that the ActiveX code in this .html file would not be accepted by many hosting sites, including our WordPress blog. Over the course of a few hours I tried various sites, almost settling on Weebly although the HTML rendered improperly. I finally realized that I was able to host single .html files on my Dropbox cloud. If you have any problem accessing this file please do not hesitate to get in touch. Experimenting with the possiblities of web-based writing spaces, as opposed to standard essay format, is an interesting endeavor but hitches such as I’ve experienced today do require some monitoring! This entry was posted in Commentary 1 and tagged Aboriginal language, communication, hypertext, language preservation, language revitalization, language shift, literacy, orality, text technology. Bookmark the permalink.